Good to hear that the plant is putting on more growth. Some plants can be fussy in pots. Be sure to let us know how it progresses. garden5 wrote: Good to hear that the plant is putting on more growth. Some plants can be fussy in pots. bottom watering container and bone meal fertilized will do it ! I'm not sure why this plant has had a difficult time growing. Infact, after I moved it to the big planter, it sat with no leaves for several months. My new worry is that the trunk will fail to support the plant. I really need to take pictures of it to better show my issue, but will try to explain for now. After sitting with no leaves for almost a year, it started to develop a new branch at the very top, on one side. It continue to branch up from that one new stem. So basically, all of the new growth you see is coming from a branch out on the top side of the trunk. The problem is, the truck has not grown to accommodate this new growth, and I am a little worried it's going to fall over one day. But other than that, I am not complaining, because it looks like I will have some peppers this spring! Wow, that's great to hear that you haven't given up on the plant and that it is now doing well! As for worrying about whether or not it will fall over, you can easily rig up some type of a stake for a support system. I've had to put strings up in my garden to hold up my habaneros, when it rains or I water they hold the water and fall over. I don't think all the weight from the peppers helps either lol. The stem isn't that skimpy but not as big as my ghost peppers, but the plant itself is getting fairly tall. Well he's my only pepper plant this year. All my other ones got planted in the ground, and the first freeze that came through wiped them out. I'm sure some might come back in the spring, but who knows. This year i've got citrus trees growing from seed, limes, lemons, oranges, ect. Wow way to stick with it You could probably put some more dirt in the pot and bury more of the stem to help support it too. You can also plant it out when spring time comes and it will be able to grow larger than it would while it's in the pot. Just be sure to pull it out and pot it up before the frost comes (there's a great thread going on over-wintering peppers in the forum). I'm thinking that since the plant is so large and healthy, you will get a very nice harvest if you plant it out in the spring. Richee wrote: Well he's my only pepper plant this year. Nope. They are tender perennials. Frost KILLS them; they won't come back in the spring. Sorry. 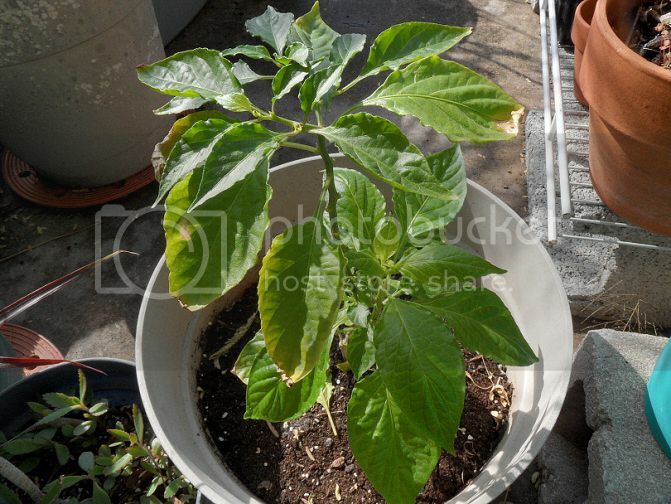 Now that the heat of Florida has been around, my Ghost Pepper went back to having no leaves after producing one pepper. Waiting 4 years for one pepper isn't exactly worth it. Getting frustrated I put it way out in the yard, where it's been sitting neglected, even through the tropical storm. I check it today and it is full of leaves, only the leaves are not very large. They are small, but in high quantity, and very healthy look. Dark green leaves and all.. but I do wonder, why are the leaves so small? And why does this plant seem to have so much trouble? Florida would seem like the ideal area to grow ghost peppers, but this one only seems to do good during the winter, and fails during the summer, rarely producing any fruit. I have one ghost pepper in my raised bed garden this year. First time ever growing one. It is growing great and faster than my habaneros, but it drops it's flowers. I thought this was due to cooler temps at night here in Michigan, but now the nights aren't getting that cool. I plan on digging it out of the garden at the end of summer and potting it so I can bring it inside. Next spring it goes back in the garden. Will I have to wait until the end of next summer to get peppers? I'm fertilizing with bone meal btw. I ordered 2 starts from ebay this year. I planted them in April, and kept them out of the frost. they were stunted for almost 1.5 months. they are in the garden, and coming to life. they are about 1.5' tall and getting bushy. my problem is that they are flowering, and loosing the flower without gaining a pepper. is this expected? 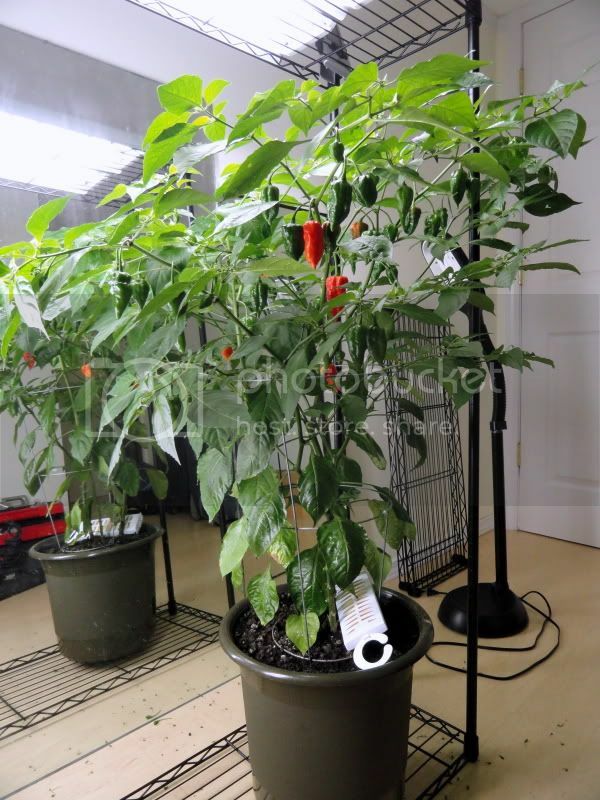 I planted jalapenos and Scotch bonnets in pots almost 3 years ago. I used the best potting soil I could find. They grew slow I brought them in during the winter, and the 2nd year I had 1 harvest from each of them. this year I planted them in the garden, they have flourished, the scotch bonnets are 2' tall and 3' around!!! I am going to try to dig what ever I like the most up and try to keep them inside for this winter. What is Eating my Ghost Pepper Leaves?